Insulin is not simply pumped out of the pancreas in a constant stream or, at least, it shouldn’t be. Like many other hormones, insulin is secreted in short bursts, or pulses, by the beta-cells in the islets of langerhans and act in unison to pump out insulin like a slow heart beat. These pulses of insulin were first observed in 1979 in the blood of fasted healthy volunteers measuring their insulin levels every minute for one to two hours (Lang 1979). Normal pulses of insulin, C-peptide, and glucose measured in blood from a peripheral vein in a healthy fasted human (Lang 1979). Rather than staying at a steady level in the blood, insulin pulses up and down every few minutes. C-peptide, which is secreted along with insulin, follows the same pattern. Changes in glucose can be seen but are too small to see clearly. After eating food requiring insulin secretion, the height of each peak increases as more insulin is released in each pulse while the pulses themselves remain roughly the same time apart. These pulses of insulin are now thought to happen roughly every 5-6 minutes. This was longer in older studies, but newer studies with better detections methods suggest a shorter gap between the pulses. As well as these fast pulses, slower oscillations of insulin every 80–180 minutes have also been measured (Polonsky 1988). These longer oscillations are called an ultradian rhythm, because they have a period of recurrence shorter than a day but longer than an hour. How the cells in each islet, and all the separate islets in the pancreas, coordinate their pulses of insulin release is complex story that is still not fully understood and would be a blog post in itself. However, from an evolutionary perspective, it is likely that this controlled nature of pulsing insulin release is beneficial to us because maintaining the machinery for this pulsatile release is costly. Pulses of insulin are more effective at activating insulin receptors than a constant exposure of insulin, at least in the liver where this has been most studied (Meier 2005). The pancreas releases insulin into the portal vein, which flows directly into the liver before spreading out through the rest of the body, so the liver feels the greatest effect of these insulin pulses. In contrast, a constant exposure to insulin results in increased insulin resistance. The physiologically normal pattern of insulin pulses is important for hepatic insulin signaling and glycemic control, and liver insulin resistance in diabetes is likely in part due to impaired pulsatile insulin secretion (Matveyenko 2012). Larger separate pulses of insulin result in more insulin being cleared by the liver, so less reaches the rest of the body (Meier 2005). In contrast, smaller less-defined pulses would mean a greater exposure of the rest of the body to insulin, as less is cleared by the liver. Where this gets more interesting is that individuals with type 2 diabetes have been found to have shorter and highly irregular pulses in their insulin (Hunter 1996). Weight loss only partially reversed the abnormalities in insulin pulses in patients with diabetes (Gumbiner 1996). The longer ultradian cycles of insulin secretion were also found to be disrupted in diabetic patients (Polonsky 1988). Abnormal insulin pulses have also been found in the first-degree relatives of diabetic patients, compared to unrelated controls, suggesting that the abnormal oscillations in insulin secretion may be an early phenomenon in the development of type 2 diabetes. (O’Rahilly 1998). Plasma insulin profile of a health person (top) and a first degree relative of a patient with diabetes (bottom) (O’Rahilly 1988). Abdominal fat is associated with both insulin resistance and decreasing gaps between the pulses of insulin release. This suggests the increased frequency of insulin pulses may play a role in causing insulin resistance in individuals with more abdominal fat. The insulin interpulse interval was the primary determinant of insulin sensitivity in this study and the increased frequency of insulin pulses were suggested to play a role in inducing insulin resistance in individuals with greater abdominal fat (Peiris 1992). As disordered insulin secretion may cause intracellular insulin resistance, it may be an initiating factor in the progression to type 2 diabetes (Schofield 2012). Constant exposure to insulin has an effect of inducing insulin resistance, the brief drop in insulin between each pulse in healthy individuals helps to prevent this. To speculate a little, the implications of this are quite interesting to me. Firstly, take as an example someone with a healthy pattern of insulin release and nice, large, separate pulses of insulin. If they eat foods requiring insulin, the pulses of insulin they produce will effectively activate their insulin receptors to clear away that glucose without inducing insulin resistance. These pulses of insulin can even encourage insulin sensitivity. However, if we take as a second example an individual who has already lost this careful coordination of pulsing insulin release, the effects could be quite different. If they eat foods requiring insulin, the uncoordinated cells in their pancreas will release a more constant stream of insulin into their blood. The lack of clear pulses of insulin will not work as effectively at shutting down glucose production in the liver, less insulin will be cleared by the liver, and the rest of the body will be exposed to more insulin. This constant exposure of insulin receptors to insulin will generate greater insulin resistance, requiring more insulin to have the same effect. It seems to me that carbohydrate intake could have very different consequences in these two individuals. Unfortunately, this pulsatility of insulin is not easy to measure and, currently, it does not seem clear what causes the coordinated release of insulin to break down, or how, or even whether it can be restored. Lang DA, Matthews DR, Peto J, Turner RC. Cyclic oscillations of basal plasma glucose and insulin concentrations in human beings. N Engl J Med. 1979 Nov 8;301(19):1023-7. In a study of whether oscillations in plasma glucose and insulin occur in human beings, plasma samples were taken at one-minute intervals from 10 normal subjects for periods lasting between one and two hours. In five subjects the basal plasma insulin concentrations cycled regularly, with a mean period of 13 minutes and mean amplitude of 1.6 mU per liter (11.5 pmol per liter). A concurrent plasma glucose cycle was demonstrated, with a mean amplitude (after averaging to minimize random error) of 0.05 mmol per liter (1 mg per decliter). The average plasma glucose cycle was two minutes in advance of the plasma insulin. In the subjects with less regular plasma insulin cycles, a similar plasma glucose rise was demonstrated two minutes before the insulin rise. These phase relations are compatible with the presence of a negative-feedback loop between the liver and pancreatic beta cells that regulates both basal plasma insulin and glucose concentrations, although the cyclic beta-cell secretion could be independent of plasma glucose. Peiris AN, Stagner JI, Vogel RL, Nakagawa A, Samols E. Body fat distribution and peripheral insulin sensitivity in healthy men: role of insulin pulsatility. J Clin Endocrinol Metab. 1992 Jul;75(1):290-4. Abdominal fat distribution is associated with insulin resistance in healthy young men. Factors modulating this phenomenon remain unclear. Pulsatile insulin release has been implicated as a potential regulator of insulin action. The relationship of pulsatility of peripheral insulin levels to fat distribution and peripheral insulin sensitivity was examined in 10 healthy men. Fat distribution was determined by the waist to hip ratio. Peripheral insulin sensitivity was assessed by the euglycemic clamp at an insulin infusion rate of 287 pmol/min.m2. Pulsatility of insulin was assessed by sampling every 2 min for 90 min in the basal state. The characteristics of insulin pulses were assessed by the computer program Pulsar. The waist to hip ratio was negatively associated with insulin sensitivity (r = -0.70, P less than 0.05) and insulin pulse interval (r = -0.66, P less than 0.05). The insulin pulse interval was positively correlated with peripheral insulin sensitivity (r = 0.73, P less than 0.05). The insulin interpulse interval was the primary determinant of insulin sensitivity. The increased frequency of insulin pulses may play a role in inducing insulin resistance in individuals with abdominal fat distribution. Gumbiner B, Van Cauter E, Beltz WF, Ditzler TM, Griver K, Polonsky KS, Henry RR. Abnormalities of insulin pulsatility and glucose oscillations during meals in obese noninsulin-dependent diabetic patients: effects of weight reduction. J Clin Endocrinol Metab. 1996 Jun;81(6):2061-8. Twenty-seven obese patients, including 8 with normal glucose tolerance, 10 with subclinical NIDDM, and 9 with overt noninsulin-dependent diabetes mellitus (NIDDM), were studied before and after prolonged weight loss to assess the effects of the underlying defects of diabetes per se from those of obesity and chronic hyperglycemia on the regulation of pulsatile insulin secretion. Serial measurements of insulin secretion and plasma glucose were obtained during 3 standardized mixed meals consumed over 12 h. Insulin secretion rates were calculated by deconvoluting plasma C peptide levels using a mathematical model for C peptide clearance and kinetic parameters derived individually in each subject. Absolute (nadir to peak) and relative (fold increase above nadir) amplitudes of each insulin secretory pulse and glucose oscillation were calculated. Compared to the obese controls, the subclinical and overt NIDDM patients manifested the following abnormal responses: 1) decreased relative amplitudes of insulin pulses, 2) reduced frequency of glucose oscillations, 3) increased absolute amplitudes of glucose oscillations, 4) decreased temporal concomitance between peaks of insulin pulses and glucose oscillations, 5) reduced correlation between the relative amplitudes of glucose oscillations concomitant with insulin pulses, and 6) temporal disorganization of the insulin pulse profiles. These defects were more severe in the overt NIDDM patients, and weight loss only partially reversed these abnormalities in both NIDDM groups. These findings indicate that beta-cell responsiveness is reduced, and the regulation of insulin secretion is abnormal under physiological conditions in all patients with NIDDM, including those without clinical manifestations of the disease. These abnormalities are not completely normalized with weight loss, even in patients who achieve metabolic control comparable to that in obese controls. The results are consistent with the presence of an inherent beta-cell defect that contributes to secretory derangements in subclinical NIDDM patients. This abnormality precedes frank hyperglycemia and may ultimately contribute to the development of overt NIDDM. Hunter SJ, Atkinson AB, Ennis CN, Sheridan B, Bell PM. Association between insulin secretory pulse frequency and peripheral insulin action in NIDDM and normal subjects. Diabetes. 1996 May;45(5):683-6. Abnormalities of both insulin secretion and insulin action occur in NIDDM. It is not clear, however, which is the primary defect. Recently, it has been suggested that the frequency of insulin pulses is an important factor regulating insulin action in normal humans. We examined the relationship between pulsatile insulin secretion and insulin action in eight NIDDM subjects and eight health matched control subjects. Insulin action was assessed prevailing fasting glucose levels before and after hyperinsulinemia (2-h insulin infusion at 2.0 mU / kg / min). Pulsatility of insulin was assessed by sampling every 2 min for 90 min after an overnight fast and identifying insulin pulses using the computer program Pulsar. Fasting plasma glucose and postabsorptive endogenous glucose production were both greater in diabetic subjects compared with control subjects (10.1 +/- 1.2 vs. 5.4 +/- 0.1 mmol/l, P < 0.01; 11.8 +/- 0.8 vs. 9.9 +/- 0.4 micromol / kg / min, P < 0.05). During the 2.0 mU insulin infusion, glucose clearance was lower in the diabetic subjects (3.6 +/- 0.7 vs. 6.9 +/- 0.5 ml / kg / min), P < 0.05), whereas endogenous glucose production was suppressed to a similar degree in both groups (4.5 +/- 0.8 vs. 3.6 +/- 0.7 micromol x kg(-1) x min(-1), NS). The frequency of insulin pulses and glucose clearance were negatively correlated in both diabetic subjects (r = -0.75, P < 0.05) and normal control subjects (r = -0.82, P < 0.01). This negative correlation was also present in both groups taken together (r = -0.72, P < 0.001). There was no correlation between insulin pulse frequency and endogenous glucose production either in the fasting state or during hyperinsulinemia. We concluded that the frequency of insulin pulses and peripheral insulin sensitivity are closely linked in NIDDM and normal subjects. Meier JJ, Veldhuis JD, Butler PC. Pulsatile insulin secretion dictates systemic insulin delivery by regulating hepatic insulin extraction in humans. Diabetes. 2005 Jun;54(6):1649-56. In health, insulin is secreted in discrete pulses into the portal vein, and the regulation of the rate of insulin secretion is accomplished by modulation of insulin pulse mass. Several lines of evidence suggest that the pattern of insulin delivery by the pancreas determines hepatic insulin clearance. In previous large animal studies, the amplitude of insulin pulses was related to the extent of insulin clearance. In humans (and in large animals), the amplitude of insulin oscillations is approximately 100-fold higher in the portal vein than in the systemic circulation, despite only a fivefold dilution, implying preferential hepatic extraction of insulin pulses. In the present study, by direct hepatic vein sampling in healthy humans, we sought to establish the extent of first-pass hepatic insulin extraction and to determine whether the pattern of insulin secretion (insulin pulse mass and amplitude) dictates the hepatic insulin clearance and thereby delivery of insulin to extrahepatic insulin-responsive tissues. Five nondiabetic subjects (two men and three women, mean age 32 years [range 25-39], BMI 24.9 kg/m(2) [21.2-27.1]) participated. Insulin and C-peptide delivery from the splanchnic bed was measured in basal overnight-fasted state and during a glucose infusion of 2 mg . kg(-1) . min(-1) by simultaneous sampling from the hepatic vein and an arterialized vein along with direct estimation of splanchnic blood flow. Fractional insulin extraction was calculated from the difference between the C-peptide and insulin delivery rates from the liver. The time patterns of insulin concentrations and hepatic insulin clearance were analyzed by deconvolution and Cluster analysis, respectively. Cross-correlation analysis was used to relate C-peptide secretion and insulin clearance. Glucose infusion increased peripheral glucose concentrations from 5.4 +/- 0.1 to 6.4 +/- 0.4 mmol/l (P < 0.05). Likewise, insulin and C-peptide concentrations increased during glucose infusion (P < 0.05). Hepatic insulin clearance increased with glucose infusion (1.06 +/- 0.18 vs. 2.55 +/- 0.38 pmol . kg(-1) . min(-1); P < 0.01), but fractional hepatic insulin clearance was stable (78.2 +/- 4.4 vs. 84 0. +/- 3.9%, respectively; P = 0.18). Insulin secretory-burst mass rose during glucose infusion (P < 0.05), whereas the interburst interval remained unchanged (4.4 +/- 0.2 vs. 4.5 +/- 0.3 min; P = 0.36). Cluster analysis identified an oscillatory pattern in insulin clearance, with peaks occurring approximately every 5 min. Cross-correlation analysis between prehepatic C-peptide secretion and hepatic insulin clearance demonstrated a significant positive association without detectable (<1 min) time lag. Insulin secretory-burst mass strongly predicted insulin clearance (r = 0.81, P = 0.0043). In conclusion, in humans, approximately 80% of insulin is extracted during the first liver passage. The liver rapidly responds to fluctuations in insulin secretion, preferentially extracting insulin delivered in pulses. The mass (and therefore amplitude) of insulin pulses traversing the liver is the predominant determinant of hepatic insulin clearance. Therefore, through this means, the pulse mass of insulin release dictates both hepatic (directly) as well as extra-hepatic (indirectly) insulin delivery. These findings emphasize the dual role of the liver and pancreas and their relationship mediated through magnitude of insulin pulse mass in regulating the quantity and pattern of systemic insulin delivery. Polonsky KS, Given BD, Hirsch LJ, Tillil H, Shapiro ET, Beebe C, Frank BH, Galloway JA, Van Cauter E. Abnormal patterns of insulin secretion in non-insulin-dependent diabetes mellitus. N Engl J Med. 1988 May 12;318(19):1231-9. To determine whether non-insulin-dependent diabetes is associated with specific alterations in the pattern of insulin secretion, we studied 16 patients with untreated diabetes and 14 matched controls. The rates of insulin secretion were calculated from measurements of peripheral C-peptide in blood samples taken at 15- to 20-minute intervals during a 24-hour period in which the subjects ate three mixed meals. Incremental responses of insulin secretion to meals were significantly lower in the diabetic patients (P less than 0.005), and the increases and decreases in insulin secretion after meals were more sluggish. These disruptions in secretory response were more marked after dinner than after breakfast, and a clear secretory response to dinner often could not be identified. Both the control and diabetic subjects secreted insulin in a series of discrete pulses. In the controls, a total of seven to eight pulses were identified in the period from 9 a.m. to 11 p.m., including the three post-meal periods (an average frequency of one pulse per 105 to 120 minutes), and two to four pulses were identified in the remaining 10 hours. The number of pulses in the patients and controls did not differ significantly. However, in the patients, the pulses after meals had a smaller amplitude (P less than 0.03) and were less frequently concomitant with a glucose pulse (54.7 +/- 4.9 vs. 82.2 +/- 5.0, P less than 0.001). Pulses also appeared less regularly in the patients. During glucose clamping to produce hyperglycemia (glucose level, 16.7 mmol per liter [300 mg per deciliter]), the diabetic subjects secreted, on the average, 70 percent less insulin than matched controls (P less than 0.001). These data suggest that profound alterations in the amount and temporal organization of stimulated insulin secretion may be important in the pathophysiology of beta-cell dysfunction in diabetes. Satin LS, Butler PC, Ha J, Sherman AS. Pulsatile insulin secretion, impaired glucose tolerance and type 2 diabetes. Mol Aspects Med. 2015 Apr;42:61-77. Type 2 diabetes (T2DM) results when increases in beta cell function and/or mass cannot compensate for rising insulin resistance. Numerous studies have documented the longitudinal changes in metabolism that occur during the development of glucose intolerance and lead to T2DM. However, the role of changes in insulin secretion, both amount and temporal pattern, has been understudied. Most of the insulin secreted from pancreatic beta cells of the pancreas is released in a pulsatile pattern, which is disrupted in T2DM. Here we review the evidence that changes in beta cell pulsatility occur during the progression from glucose intolerance to T2DM in humans, and contribute significantly to the etiology of the disease. We review the evidence that insulin pulsatility improves the efficacy of secreted insulin on its targets, particularly hepatic glucose production, but also examine evidence that pulsatility alters or is altered by changes in peripheral glucose uptake. Finally, we summarize our current understanding of the biophysical mechanisms responsible for oscillatory insulin secretion. Understanding how insulin pulsatility contributes to normal glucose homeostasis and is altered in metabolic disease states may help improve the treatment of T2DM. Schofield CJ, Sutherland C. Disordered insulin secretion in the development of insulin resistance and Type 2 diabetes. Diabet Med. 2012 Aug;29(8):972-9. For many years, the development of insulin resistance has been seen as the core defect responsible for the development of Type 2 diabetes. However, despite extensive research, the initial factors responsible for insulin resistance development have not been elucidated. If insulin resistance can be overcome by enhanced insulin secretion, then hyperglycaemia will never develop. Therefore, a β-cell defect is clearly required for the development of diabetes. There is a wealth of evidence to suggest that disorders in insulin secretion can lead to the development of decreased insulin sensitivity. In this review, we describe the potential initiating defects in Type 2 diabetes, normal pulsatile insulin secretion and the effects that disordered secretion may have on both β-cell function and hepatic insulin sensitivity. We go on to examine evidence from physiological and epidemiological studies describing β-cell dysfunction in the development of insulin resistance. Finally, we describe how disordered insulin secretion may cause intracellular insulin resistance and the implications this concept has for diabetes therapy. In summary, disordered insulin secretion may contribute to development of insulin resistance and hence represent an initiating factor in the progression to Type 2 diabetes. The names of fatty acids that make up the fats in the world around us can be so familiar that we rarely consider where these names came from. While fatty acids now have systematic names and precise scientific names that describe their structure, these are rarely used. The old names, known as trivial or common names, are still generally preferred. Given my predilection for knowing the why and wherefore of things, I ended up looking up where these names originated from. This is the non-systematic and, hopefully mostly accurate, result of my reading. Trivial names (or common names) are non-systematic historical names, which are the most frequent naming system used in literature. Most common fatty acids have trivial names in addition to their systematic names. These names frequently do not follow any pattern, but they are concise and often unambiguous. Formic acid (C1:0). The smallest of the short-chain fatty acids, formic acid contains only one carbon atom. The name “formic” originates from Formica, the Latin name for a genus of ants commonly known as wood ants. Wood ants typically secrete formic acid as a defense mechanism and one species, Formica rufa, can squirt the acid from its acidopore several feet if alarmed. Formic acid was first distilled from a large number of crushed ants of this species by the English naturalist John Ray in 1671. Acetic acid (C2:0). The name acetic acid actually derives from acetum, the Latin word for vinegar. Acetic acid without any water is called glacial acetic acid, the name referring to the ice-like crystals that form at slightly-below room temperature. Propionic acid (C3:0). Propionic acid was named by the French chemist Jean-Baptiste Dumas in 1847, from the Greek words prōtos, meaning first, and piōn, meaning fat, because it is the smallest fatty acid that can exhibit the properties of the longer-chain fatty acids. Butyric acid (C4:0). Butyric acid makes up 3–4% of the fatty acids in butterfat, after which it is named from the Latin word for butter, butyrum. Valeric acid (C5:0). This is found naturally in the perennial flowering plant valerian (Valeriana officinalis), from which it gets its name, and is also responsible for the typical odor of valerian roots that can be reminiscent of unwashed feet. Capric acid (C10). Capronic, caprylic, and capric acid are all named after the domestic goat (Capra aegagrus hircus), as these three fatty acids make up around 15% of the fat in goats milk. Caprylic and capric acid also apparently have a rather goat-like odor about them. Lauric acid (C12:0). 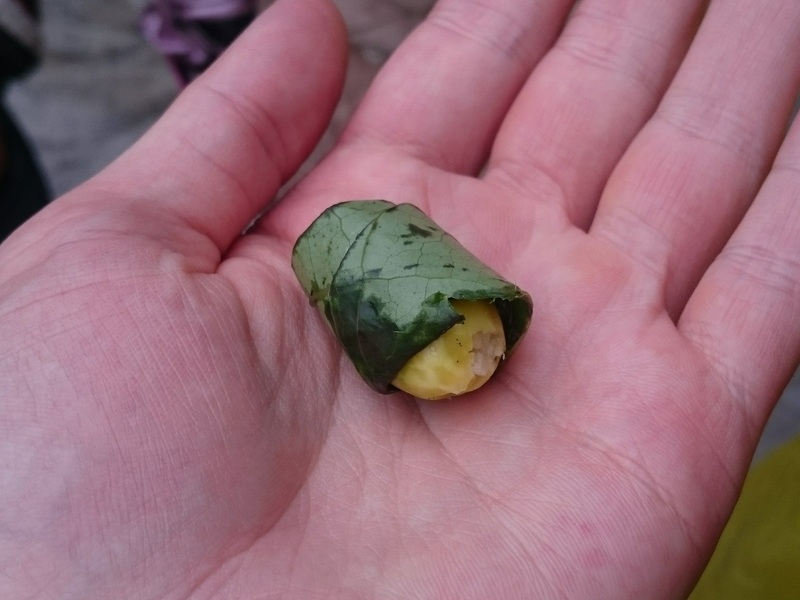 Found in the leaves and berries of Laurus nobilis, from where this fatty acid gets its name, these leaves are more commonly known to us as bay leaves. Myristic acid (C:14). This fatty acid was first isolated from nutmeg, the oil of which is mostly composed of myristic acid, in 1841 by Lyon Playfair and is named after the latin name for the nutmeg tree (Myristica fragrans). Palmitic acid (C16:). As its name indicates, it is a major component of the oil from the fruit of oil palms in which it was discovered by Edmond Frémy in 1840. Sapienic acid (16:1). Not a fatty acid you will find in your food (unless you are a cannibal), sapienic acid is unique to humans and is found in the sebum on the skin. It takes its name from our species name Homo sapiens. Margaric acid (C:17). Found only in small amounts in the fat and milk fat of ruminants. First discovered by French chemist Michel Eugène Chevreul in 1813 it was named after the pearly appearance of the fatty acid after extraction, the w from Greek margaritēs/márgaron, meaning pearl-oyster or pearl. Margaric acid gave its name to margarine, as the principal raw material in the early formulations of margarine was beef fat. Stearic acid (C18:0). This name comes from the Greek word “stéar”, which means tallow, of which stearic acid is a major constituent. Oleic acid (18:1).The term “oleic” means related to, or derived from, olive oil, which is predominantly composed of oleic acid. Vaccenic acid (18:1). A naturally occurring trans-fatty acid found in the fat and dairy products of ruminants. The name was derived from vacca, the Latin word for a cow. Linoleic acid (18:2). The word “linoleic” derives from the Latin name of the Flax plant, Linum usitatissimum (also known as linseed), in which it is found, and oleic in reference to the olive because saturating the omega-6 double bond produces oleic acid. alpha-Linolenic acid (18:3). This name derives from linoleic acid (linoleic +‎ -ene) with the “ene” signifying it has one extra double bond. Arachidic acid (C:20). Not in fact found in spider fat, this fatty acid gets its name from the peanut plant Arachis hypogaea, in which it makes up 1.1%–1.7% of peanut oil. Arachidonic acid (20:4). Also not in fact named after spiders, so named as it is structurally related to arachidic acid, containing the same number of carbon atoms. However, the four double bonds give it very different properties. The complex structures within which nutrients exist inside foods can change the way our body responds to those foods. In two recent posts I looked at the how consuming the same amount of sugar either as fruit or juice can change blood sugar and insulin responses. After this I was reminded of another similar study from 2002 that tested breads and pasta and measured changes in some of the gut hormones that might be responsible for these effects. Study: Postprandial glucose, insulin, and incretin responses to grain products in healthy subjects. In this study 20 subjects, 10 men and 10 women, with a normal BMI and normal glucose tolerance were fed four different meals on different days after an overnight fast. The meals were white flour wheat bread, whole kernel rye bread (60% rye kernels, 40% rye flour), rye bread with added beta-glucan fibre, or wholemeal pasta. Each meal contained 50 grams of available carbohydrate. First the study authors measured blood glucose levels after the meals. All three types of bread produced about the same peak in blood glucose while the pasta produced a lower peak. The glycemic index was not any different between the breads despite a big difference in the amount of fibre they contain. But while the peak in glucose was the same, 90 minutes after eating the white bread blood sugar fell to a lower level than after the other breads and stayed lower for a couple of hours. Now look at the insulin levels after eating the same meals. While pasta only produced a peak of insulin of 94 pmol/l above the fasting level, the whole kernel rye bread peaked at 135, the rye with added beta-glucan at 181, and the white flour wheat bread as high as 231. The two rye breads are particularly interesting as rye bread with added beta-glucan fibre resulted in a higher insulin response than whole kernel rye, despite containing 17 grams of fibre compared to only 13 in the whole kernel rye. This suggests that adding purified fibre into a food does not reap all the benefits of having fibre intact within the food. White wheat bread produced the highest insulin, much higher than the wholemeal pasta, despite both being made from wheat. The Durum wheat from which pasta is made from is different to bread wheat and the resulting structure of the starch in pasta is likely to be quite different. But how are these meals resulting in such large differences in insulin when they contain the same amount of carbohydrate? Firstly, the amount of insulin released by the pancreas is not determined solely by the level of glucose in the blood. Hormones called incretins released by the gut itself shape the insulin response of the pancreas. Two of the main incretin hormones are glucagon-like peptide-1 (GLP-1) and glucose-dependent insulinotropic polypeptide (GIP). Secondly, the amount of these gut hormones produced by the gut is influenced by the amount and type of food being digested. To see if these incretin hormones could be playing a role they first measured GIP levels after the different meals. As you can see in the graph above white bread resulted in by far the highest GIP levels. Rye bread with added beta-glucan also resulted in higher GIP than whole kernel rye bread. As one of the main functions of GIP is to induce insulin secretion this probably explains some of the variation in insulin responses between meals. Similarly, with GLP-1, levels were higher after white wheat bread and rye bread with added beta-glucan compared to whole kernel rye or pasta. As one of the functions of GLP-1 is to stimulate more insulin release this is also going to increase the insulin responses to the white bread. Both gut hormones GIP and GLP-1 stimulate the secretion of insulin they have wider effects beyond just insulin release. Within the pancreas, they both promote an increase in insulin producing cells. While GIP enhances glucagon release, GLP‐1 suppresses it. In body fat, GIP enhances fat storage but GLP‐1 does not. These different effects suggest that the balance between these different hormones might be important. I shall discuss these more in another post. This study interests me so much because it shows how foods with similar ingredients and carbohydrate content, but with different structural properties, can cause such different responses in our bodies. It also means that the glycemic index is not a good guide for how different foods affect our hormonal responses to eating. Juntunen KS, Niskanen LK, Liukkonen KH, Poutanen KS, Holst JJ, Mykkänen HM. (2002) Postprandial glucose, insulin, and incretin responses to grain products in healthy subjects. American Journal of Clinical Nutrition. 75(2):254-62. BACKGROUND: Various botanical and structural characteristics of starchy food modify the postprandial glucose and insulin responses in humans. OBJECTIVE: We investigated what factors in grain products affect human glucose and insulin responses and elucidated the mediating mechanisms. DESIGN: Ten men and 10 women [mean age: 28 +/- 1 y; mean body mass index (in kg/m(2)): 22.9 +/- 0.7] with normal glucose tolerance were recruited. The test products were whole-kernel rye bread, whole-meal rye bread containing oat beta-glucan concentrate, dark durum wheat pasta, and wheat bread made from white wheat flour. Paracetamol, a marker of the rate of gastric emptying, was added to the breads during baking. Each product provided 50 g available carbohydrate and was served in random order with breakfast (except for the beta-glucan rye bread, which was served at the last visit). Fasting and 8 postprandial blood samples were collected at intervals of 15-30 min for 3 h to determine plasma glucose, glucose-dependent insulinotropic polypeptide (GIP), glucagon-like peptide 1 (GLP-1), serum insulin, and paracetamol concentrations. The in vitro starch hydrolysis, the structural characteristics (by light microscopy), and the molecular weight of beta-glucan in the test products were analyzed. RESULTS: Glucose responses and the rate of gastric emptying after consumption of the 2 rye breads and pasta did not differ from those after consumption of white wheat bread. However, insulin, GIP, and GLP-1 responses, except for GLP-1 responses to the rye bread containing oat beta-glucan concentrate, were lower after the consumption of rye breads and pasta than after consumption of white wheat bread. CONCLUSIONS: Postprandial insulin responses to grain products are determined by the form of food and botanical structure rather than by the amount of fiber or the type of cereal in the food. These effects may be mediated through GIP and GLP-1. Our second day in the mountains of central Taiwan dawned sunnier than the previous day with views across the village of Huanshan across the forested mountains. 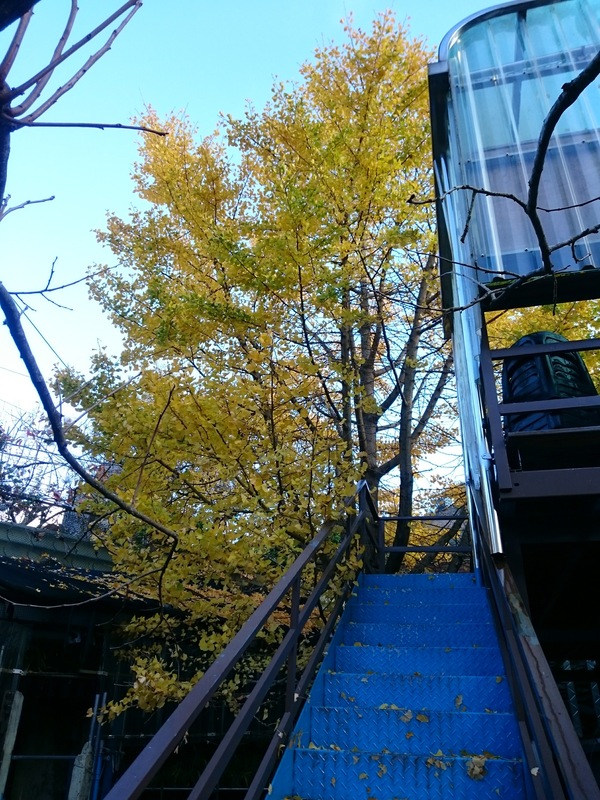 Our night was spent at the lovely Happy Ginkgo guesthouse with its ginkgo trees turned a beautiful yellow colour in the winter and persimmon trees growing in the garden. We were kindly offered to pick our own as, fortunately for us, the persimmons were currently just ripening. 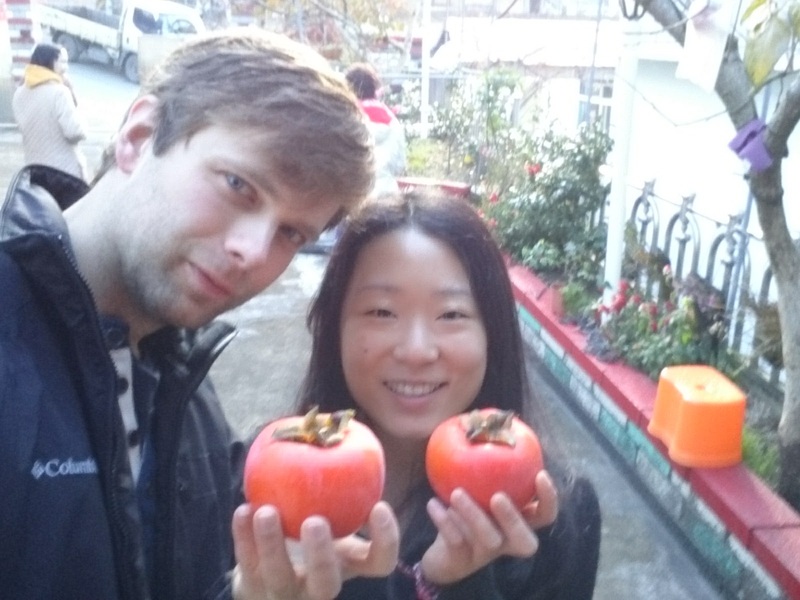 After our breakfast in the village of fried eggs, Chinese radish cakes, dumplings, and hot milk tea, we headed out for a visit to one of the local fruit farms where local snow pears and persimmons were being grown and packed for sale around Taiwan. The mountain pears grown here are particularly prized for their size and delicate flavour. Here, we had more opportunity for fruit picking, being shown the correct way to pick persimmons and snow pears, of which we were kindly allowed to keep one of each fruit we picked. Meanwhile, chickens foraged under the persimmon trees that had finished fruiting, finishing off any fallen fruit and clearing the ground beneath the trees. Inside, we were shown how the fruit is packaged for sale. While the fruit from this area had previously been sold to wholesalers, the locals are now working to package and sell directly with more provenance, as well as benefit from the region’s reputation for the quality of its fruit. After our fruit picking, and consuming rather a large amount of fruit, we headed on to stop at Li Shan to admire the views across the mountains and the famous Li Shan Guesthouse. Originally built in 1971 after the building of the Central Cross-Island Highway first brought tourists to Li Shan, the village and guest house were severely damaged by the Jiji Earthquake in 1999 and typhoon Mindulle in 2004 and only recently reopened. During its early days, the guest house was a favourite summer retreat of Chiang Kai-shek escaping the the summer heat of the coast. The palace-style guest house, designed by Yang Cho-Cheng, was itself beautiful and set in a spectacular position with stunning view across the valley. 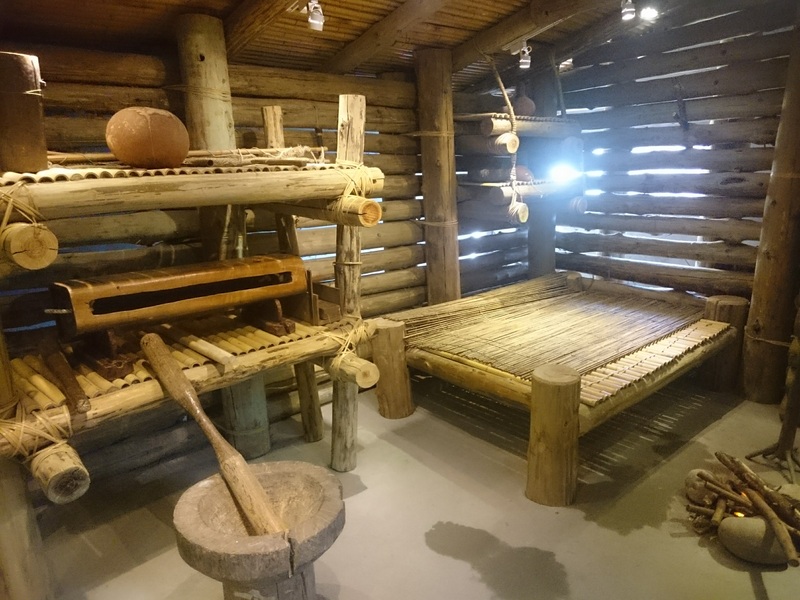 After lunch, we moved on to the nearby Lishan Culture Museum displaying the history of of Lishan, the native Atayal Tribe, and the construction of the central Taiwan highway. The museum itself had amazing views across the valley towards Xueshan, literally “Snow Mountain”, the second highest mountain in Taiwan and in the whole of East Asia, rising to 12,749 ft. 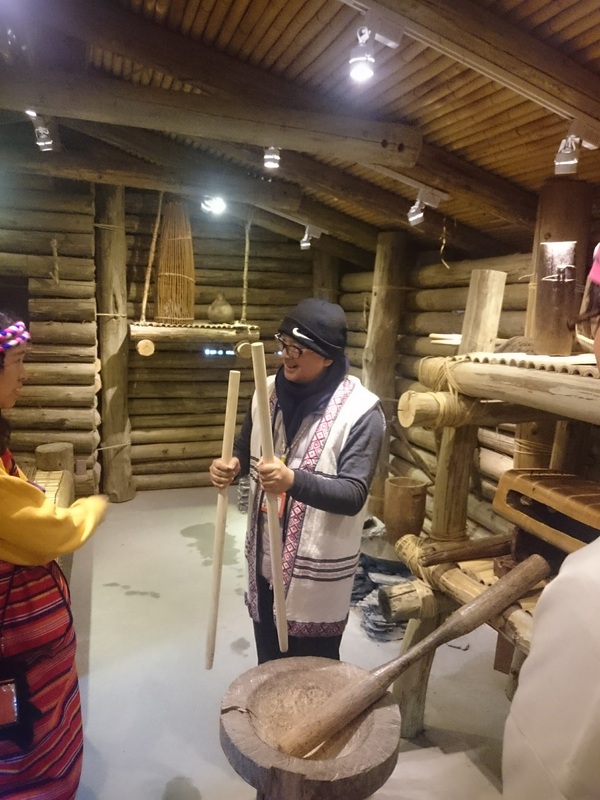 In the museum, we were dressed in local Atayal dress and shown around by a lovely, and very enthusiastic, guide. 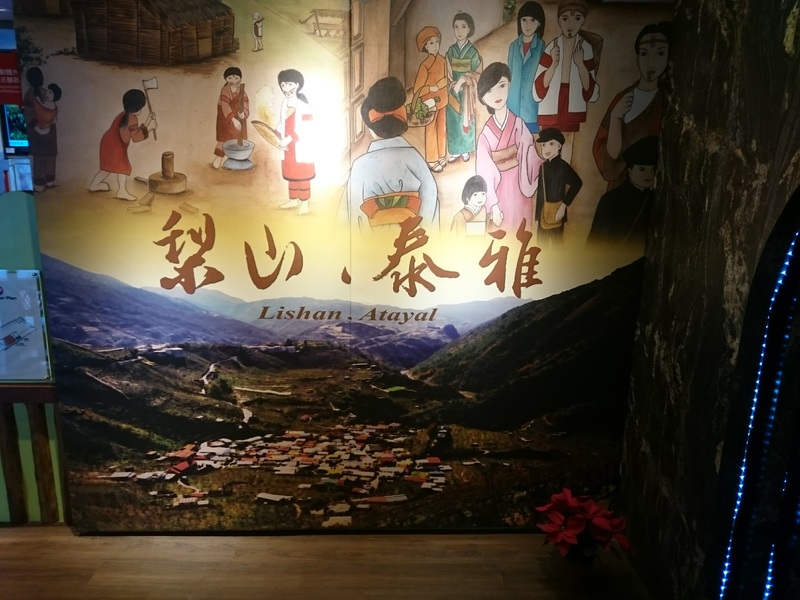 The museum displays, which helpfully included many English translations, contained a wealth of information on the local area and its history. 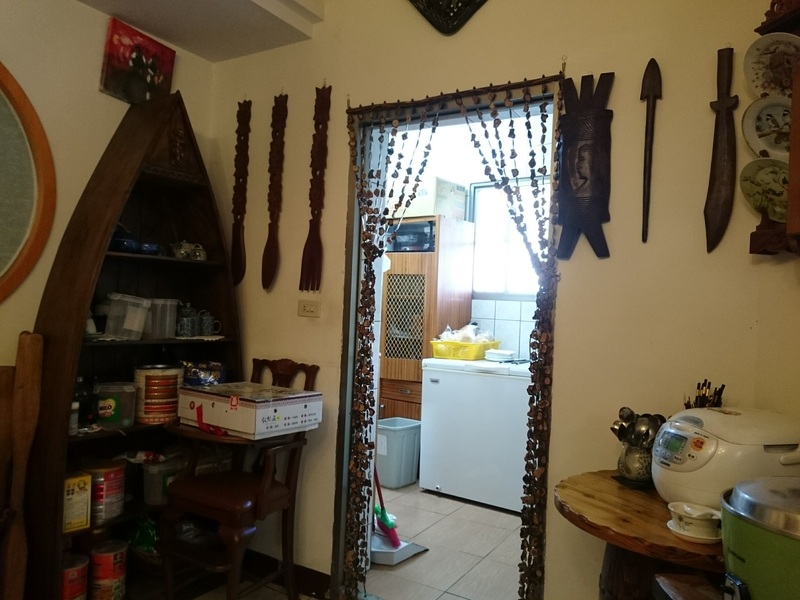 I was particularly interested in the cultural history of the local Atayal people, the information on their food, and the restrictions of their homes from the past. With our fill of history, we moved on to another local specialty, the high mountain tea plantations that perch precariously on the mountain tops high above the valley below. The Xin Jia Yang tea garden clings to the mountain side with its neatly trimmed rows of tea bushes covering the slopes beside the steep switchback road. 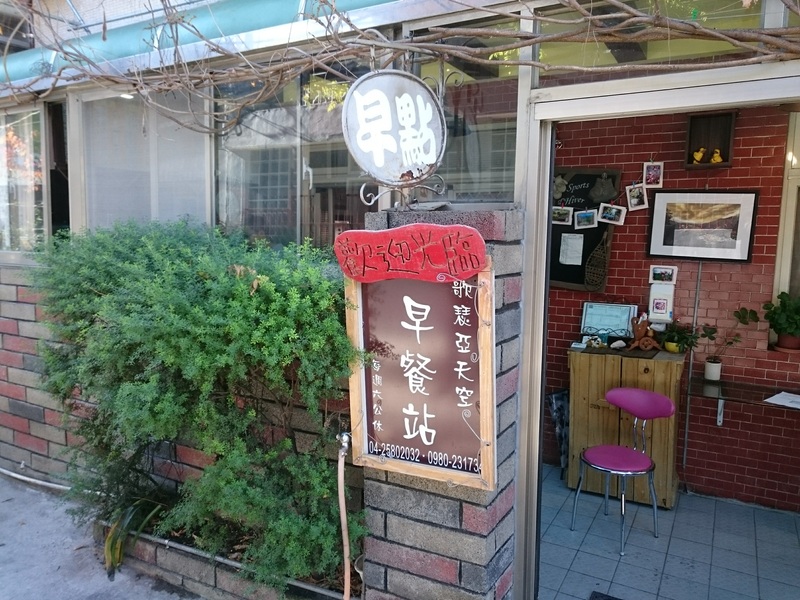 The tea grown here is a high mountain oolong for which this area is famous. This tea garden specialised in tea grown without the application of pesticides, the nibbling of insects resulting in higher levels of phytochemicals in the tea leaves and reputedly improving the flavour of the tea. Inside the tea processing building ,we had a guided tour through the different stages involved in turning fresh tea leaves into oolong. Finally, we had the chance to taste some of the rare and expensive tea produced from the surrounding tea garden. Definitely some excellent oolong and very interesting to see the beautiful mountain top landscape in which this tea is grown. Sadly, after our tea it was time to start the long drive back along the winding mountain roads back to Taichung. 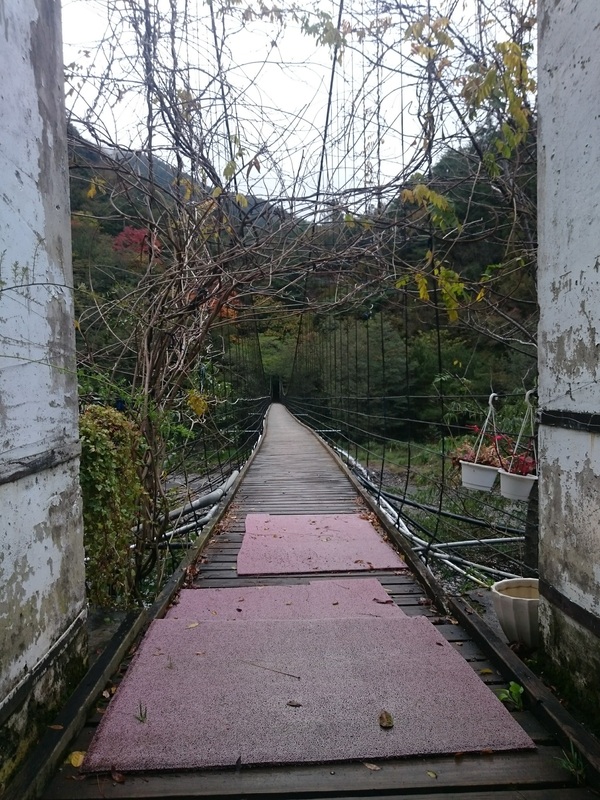 The mountainous region around Lishan was very different to the rest of Taiwan and I was very glad to have experienced it, albeit all too briefly, on my visit to this country. 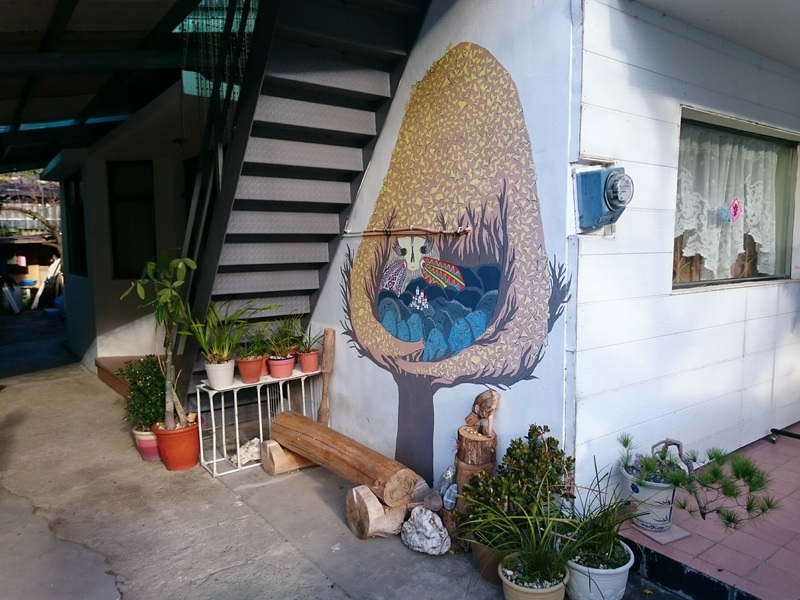 The island of Taiwan is perhaps best known to Europeans, if they know about it at all, for its great capital Taipei with its towering Taipei 101, spotless metro system, and bustling night markets. But travel away from the highly populated west coast of the island and you enter a different world of towering forest covered mountains and deep river cut valleys inhabited by the original aboriginal tribal people of Taiwan. These aboriginal peoples were the indigenous inhabitants of the island before immigration of Chinese people from the mainland began in the 17th century. 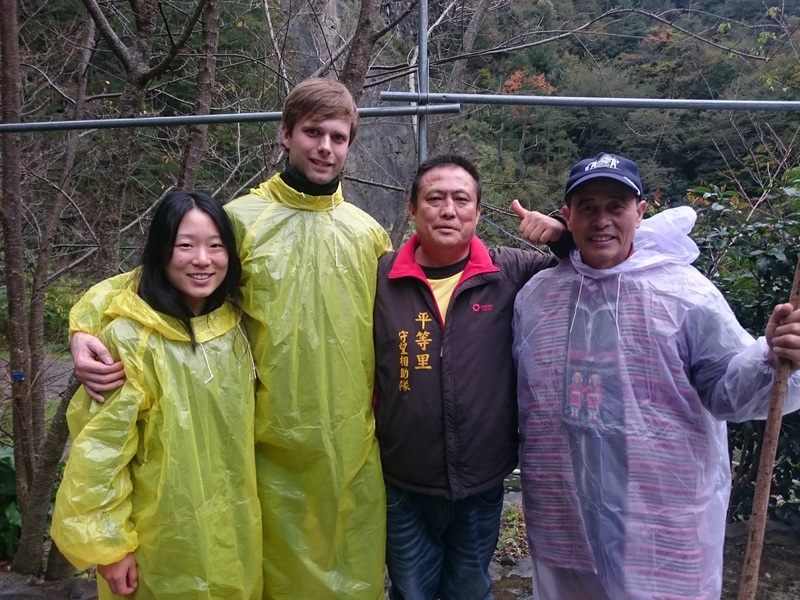 On a recent visit to Taiwan I was fortunate enough to spend two days visiting this mountainous area around Lishan visiting members of local Atayal tribe. 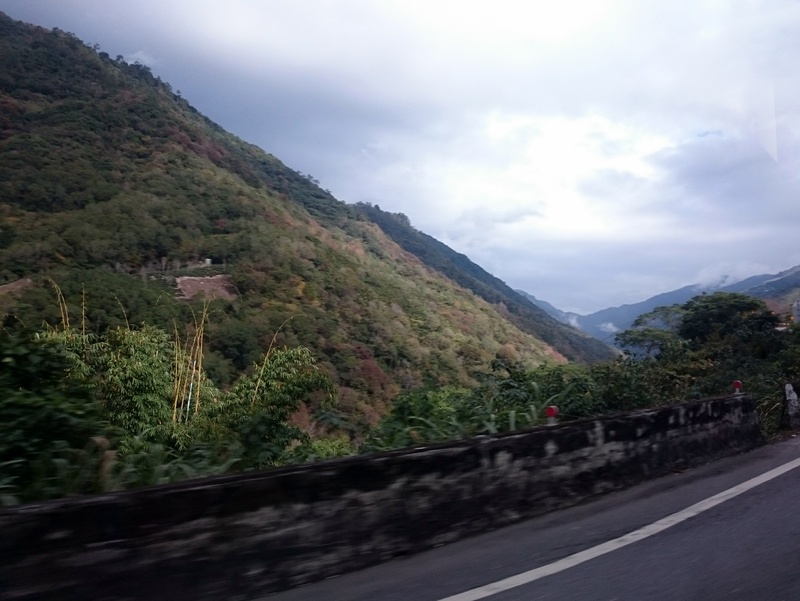 After being picked up by minibus in the city of Taichung on the east coast of Taiwan we headed inland where the jagged forested mountains rise up sharply from the agricultural coastal plain. As the mountains grew we passed the point on the road where a bridge once stood marking the start of the tribal territories of the mountains, beyond which the Chinese lowland peoples of the plains were not permitted to pass, but where trade could take place. The road climbed further into the clouds and wound along high mountain sides and ridges the views became shrouded in mist. This sadly obscured any views at the highest part on the route as the road wound above 10,000 feet. Stopping briefly in the town of Lishan, which stretches along the mountain side at over 6,000 feed, with just time to admire the stunning mountains shrouded in clouds, we pressed on to our destination in the village of Huanshan for a much needed lunch. 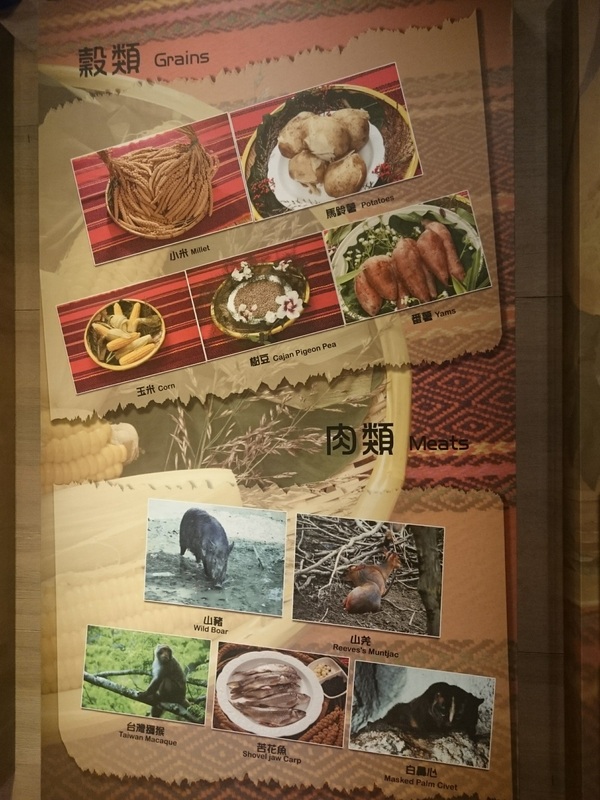 On arrival in Huanshan we were met with a spread of delicious traditional dishes making up an aboriginal mountain feast. As food is one of my main interests in life this was of particular interest to me. 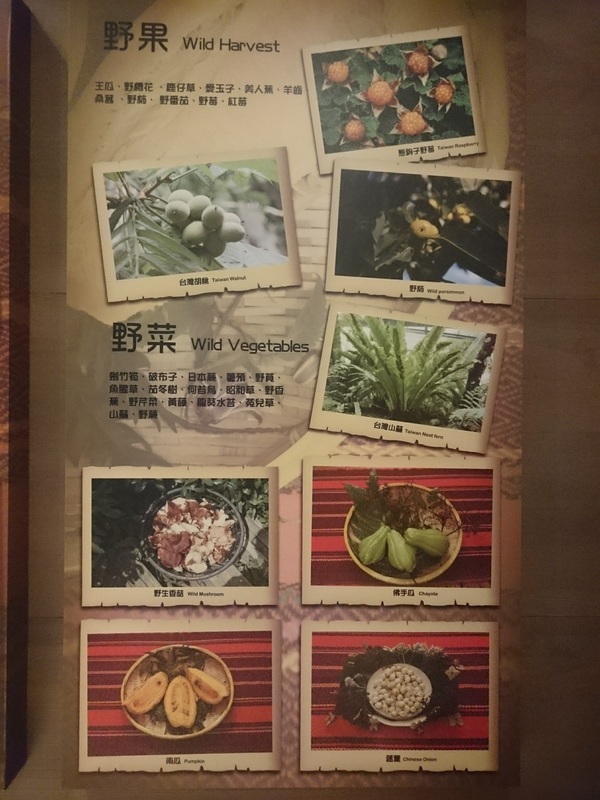 This included mountain grown cabbage, which is famed in Taiwan, small shrimp from the local reservoir, a local river fish, and wild mountain pig, all cooked by some excellent local cooks of the village. The plate of round balls was a local traditional feast food of pounded beans. The local fish were particularly good and this feast was followed by bowl of light broth filled with fish paste dumplings, carrot, bamboo shoot, and radish. To finish the meal we were served a plate of the local snow pears, for which the Lishan area is famous, Lishan literally translating as Pear Mountain. Needless to say these snow pears were delicious, light, crunchy, and mildly sweet, and of which I ate some quantity. After our our long morning bus ride and large lunch we headed out for some much needed exercise for a walk with a local guide from the village for some education into the forest and hunting knowledge of the local people. As we walked down among the village pear and persimmon orchards into the deep river valley our guide explained the various plants and trees that have traditional uses among the Atayal people of the local area. This included the Litsea cubeba tree, known as maqaw or “mountain pepper” by the Atayal, and used as a flavouring for food. Reaching the river at the foot of the valley we came to the bridge joining the settled side of the river, with its villages and orchard covered slopes, to the forested mountains across the river. By the bridge we met with an affable local who kindly offered us some Taiwanese liqueur flavoured with herbs reminiscent of cough medicine, and who offered me an areca nut wrapped in a betel leaf to try. I did not want to miss the opportunity to try this mildly toxic local stimulant. The experience of chewing it was quite bitter and left me with a feeling of being mildly caffeinated and spaced out for the next few hours. Interesting to try, but not one to make a habit out of. 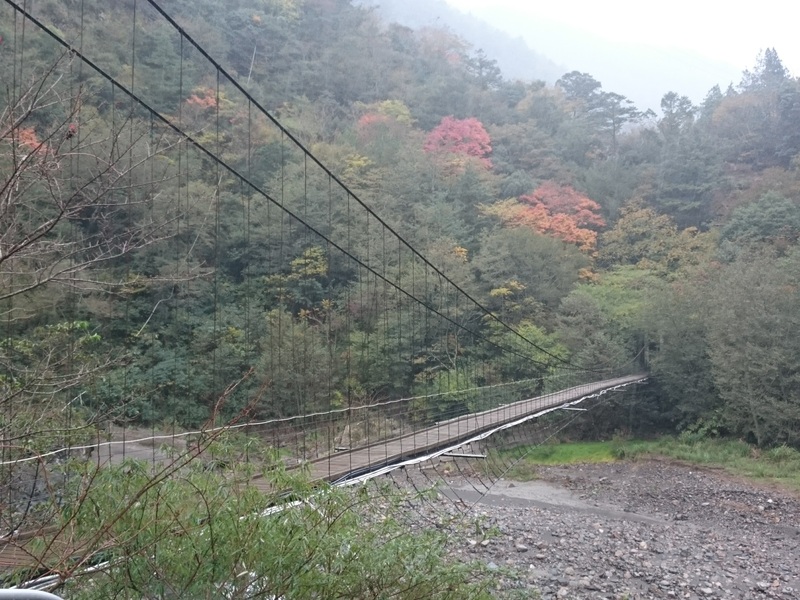 We paused on bridge while our guide gave an offering to the local spirit of the river for safe passage into the forest. The spirit in question being offered to the spirits here was a Kaoliang, local Taiwanese speciality distilled from fermented sorghum. 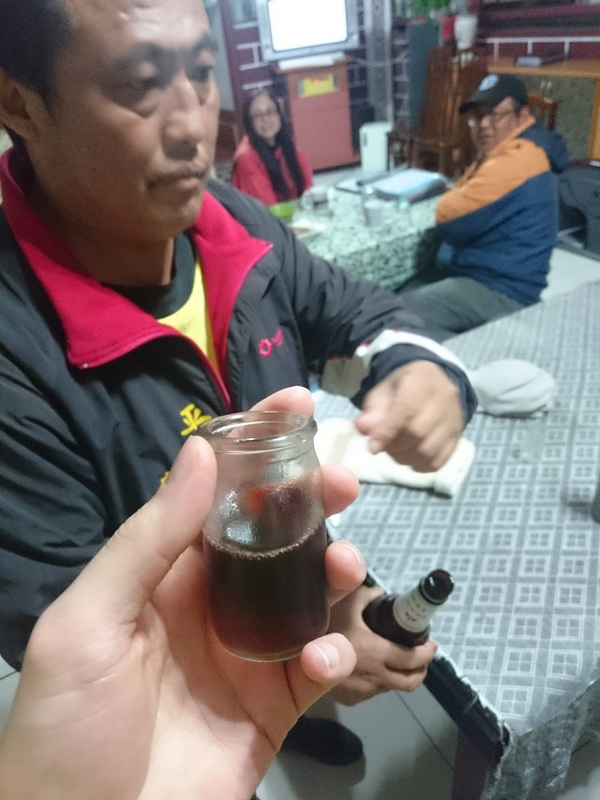 The addition of an Asian giant hornet to the liquor by our guide reputedly added a little extra sweetness to the drink. I was just glad it was pickled and that I was not meeting it live. In the forest we met with one of the local hunters from the village who demonstrated some of the local traps used for catching game on the forested mountainsides. This included a spring loaded snare trap for mountain pigs and deadfall traps for smaller animals and birds. The snare trap was particularly impressing to triggered by a branch in place of a pigs foot. Our exploration of the forest continued with a walk further up the hillside before a rest stop at the top to enjoy some more of the local snow pear, expertly peeled by our local guide. On the way back another local plant, this time a fern, caught our guide’s eye for us to try. This is plant traditionally made use of by hunters in the forest for the fleshy round roots growing at the base of its leaves, which were juicy and crunchy when eaten raw. 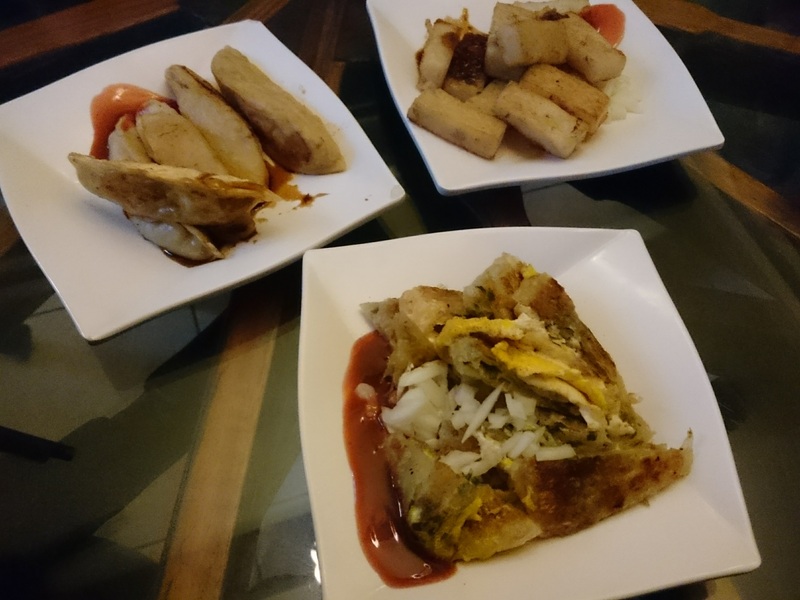 Our evening meal that night was a traditional aboriginal feast cooked by one of our local hosts in the village of Huanshan and featured a range of traditional dishes. This included the green vegetable at the top of the photo, the leaves of a local plant water plant collected from the mountain river sauteed and sprinkled with the maqaw. A plate of dark wood ear mushrooms collected from the mountain forest added an interesting chewy texture to the meal. A dish of raw pork fermented with millet which was apparently a traditional favourite of the mountains, although unfortunately out of misplaced worry over foreign tastes they briefly cooked the pork before serving it to us. I would have liked to try it raw, but I contented myself with eating quite a lot of it cooked. A bowl of beans and millet represented a traditional staple of mountain people before rice became commonly available. Poached snow pears were our dessert. This was a long tiring day but well worth it for the new experiences, interesting foods, and beautiful mountain scenery. The second day of this trip will following shortly. The effects of eating whole fruit or drinking fruit juice on blood glucose and insulin appears to be of some interest to people. As my last post on a study comparing apples, smoothies, and juice garnered some attention, I thought I would follow this up by looking a later study by the same researchers: “The role of dietary fiber in satiety, glucose, and insulin: studies with fruit and fruit juice“. This study expanded on the previous research on apples by comparing the effects of both oranges and grapes on blood glucose and insulin as either whole fruit or juice. South African Navel oranges were used for both the fruit and the juice. As the oranges had a lower amounts of sugar than the apples, the total sugar in each test meal was reduced to 50 grams, to avoid over-stuffing their volunteers with fruit. Even so, it took over 600 grams of peeled oranges to reach 50 gram dose of sugar. The equivalent 600 ml of orange juice was produced by hand using an orange reamer (some task!) and the fibre removed using a pectinase enzyme. As in the previous study, both test meals were fed to ten volunteers, on separate occasions, and after being fasted overnight. There wasn’t any difference in the spike in blood sugar after eating oranges or drinking the orange juice. While blood sugar dipped below fasting levels for both fruit and juice, it returned to normal rapidly after eating the oranges but the reactive hypoglycemia persisted to the end of the experiment after drinking juice. Insulin increased significantly more after drinking orange juice than after eating the oranges. The total insulin produced, calculated as the area under the curve, was also quite a bit larger after drinking the juice. Both the blood glucose spike and the insulin response were quite similar to what we saw from the apples in the previous post. It takes a lot more insulin to manage the sugar in orange juice than the same amount of sugar in oranges. However, just to prove that nothing is totally consistent in nutrition, we now turn to grapes. Spanish black Napoleon grapes were used for both eating and pressing into juice. Each test meal contained 60 grams of sugar, which was equivalent to 339 grams of grapes or 323 ml of grape juice. The volunteers were required to drink the juice at the same speed they had eaten the fruit, which took an average of 19 minutes. As you can see, both the whole grapes and grape juice produced very similar blood glucose responses, with juice producing a slightly faster rise in glucose. Both reduced blood glucose below fasting levels by a similar amount. Paradoxically, and unlike with apples and oranges, the whole grapes tended to produce a higher insulin response than the grape juice. Althought insulin was only significantly higher at four time points, the overall area under the curve was greater for grapes than from grape juice. The authors of this study wondered whether the high osmolality of the grape juice was slowing its passage through the stomach and, therefore, reducing the insulin response. They repeated the tests with grape juice watered down half-and-half with water. Diluting the grape juice didn’t significantly reduce the blood glucose peak compared to regular juice and, rather than improving the reactive hypoglycemia, it actually made it a bit worse. Why this should be is unclear. Diluting the juice had no effect on insulin levels compared to the undiluted juice. This means the osmolality of the juice probably wasn’t the cause of the odd insulin responses. Perhaps diluting fruit juice isn’t all that beneficial after all. This follow-up study confirms that effects for apples and oranges are similar. That is, there is not much difference in blood glucose spikes between fruit and juice, but there is a greater increase in insulin production and prolonged reactive hypoglycemia after drinking juice. The results for the grapes just goes to show how variable results can be in nutritional science when comparing between different foods. The authors of the study could not put forward any definite answer for why grapes behaved differently, other than suggesting that their lower fibre content and relative lack of internal structure may have played a role. In general, it seems that eating some fruit is probably metabolically healthier than drinking fruit juice, although a little caution may be in order before generalising this to every type of fruit. Bolton RP, Heaton KW, Burroughs LF. (1981) The role of dietary fiber in satiety, glucose, and insulin: studies with fruit and fruit juice. American Journal of Clinical Nutrition.34(2):211-7. These researchers from the Bristol Royal Infirmary and the Long Ashton Research Station were interested in testing the fibre hypothesis, proposed by Thomas L. Cleave and detailed in his 1974 book ‘The Saccharine Disease’. Cleaves’ proposition was that the consumption of refined, fibre-depleted, carbohydrates results in overnutrition and obesity and diabetes, due to reduced satiety and excessive insulin secretion. To compared the presence or absence of fibre they compared whole apples, pureed apple, and apple juice with all the fibre removed. The apple purée, what would now be called a smoothie, represents a food in which the fibre is present but the physical structure of the food disrupted. Based in the south-west of England and having the expertise from the Long Ashton Research Station, a small government agricultural research institute specialising in apples, and other fruit production, the apple seems the natural choice of experimental fruit. The researchers involved went to quite some length to make the study as well controlled as possible. All the apples used were Golden Delicious apples, harvested from a single plot of land. The apple juice was made by pressing fresh apples, removing any traces of fibre, and then pasteurised. Each meal contained 60 grams of carbohydrate, equal to 482 grams of whole apple, roughly three apples. The apple smoothie was blended just before consumption with 150 millilitres of water added. To make sure everything was equal the volunteers also drank 150 millilitres of water with the whole fruit and juice. The apples, smoothie, and juice was fed to ten healthy volunteers (rather honestly reported as all being staff in the department) aged between 24 and 40, with a healthy body weight, and importantly with a good set of teeth. These volunteers fasted overnight and avoided any alcohol for 24 hours before each test meal. After eating the apples blood sugar increased, peaking at 30 minutes, and then quickly fell back to the fasting levels by 60 minutes. Blood sugar rose to the same level after drinking the smoothie or juice. What was more interesting is what happened after the blood sugar levels fall back down. Instead of returning to normal levels after drinking the smoothie or juice the volunteers blood sugar dropped below fasting levels and remained lower for at least a couple of hours. To see if drinking fast or slow influenced this effect the volunteers first drank their smoothie or juice fast as they wanted, and then in a second test drank gradually over the same time they had taken to eat their whole apples. Curiously, drinking slowly or quickly didn’t make any difference to their blood sugar response. Insulin also peaked around 30 minutes after eating the whole apples and then dropped back to normal levels. After drinking the apple juice slowly, the volunteers’ insulin peaked at almost double the level it reached after eating the apples whole. Curiously, insulin did not reach such a high level after drinking the apple juice quickly. The insulin response to drinking apple smoothie was somewhere in between, but still higher than eating the apples whole. As with the juice, when they drank the smoothie quickly their insulin did not increase as much. Surprisingly, the fibre in whole apples did not slow down the rise in blood sugar after eating compared to juice, as if often claimed. More worryingly, the effect of juice or smoothie seemed to be to disrupt the normal mechanisms that keep blood sugar under control after the initial blood sugar rise after eating. The rebound fall in blood sugar in the second and third hours after drinking the smoothie or juice was in stark contrast to the steady levels seen after eating the apples. The greater rises in insulin after drinking the apple juice or smoothie means that more insulin was needed to keep blood sugar the same. Although drinking quickly reduced the peak in insulin a bit it didn’t help prevent the rebound drop in blood sugar. This means that removing the fibre from the apple, or even just breaking up the physical structure of the fibre, contributes to disrupting the normal mechanisms that regulate blood sugar and insulin after drinking it, compared to eating the fruit whole. If repeated regularly these inappropriately insulin responses and falls in blood sugar after drinking juice seem unlikely to be very good for you. In real world situations apple juice or smoothies are likely to be drunk in greater amounts than would be eaten as whole apples, further exacerbating these effects. One volunteer in the study had to be excluded from the analysis as “…soon after her apple meal, she passed several watery stools containing obvious particles of fruit.” Almost half a kilo of apple was obviously too much for this poor woman. Another volunteer, after drinking the apple juice, showed blood sugar levels below 2.0 mmol/l (36 mg/dl), a very low level! These unusual findings are rarely reported in research papers now but do go to show how individual people can be in their responses. Haber GB, Heaton KW, Murphy D, Burroughs LF. <<<For the first post of this weeks food see here. The weekend usually involves more cooking for me and it is when I do my main shopping. This includes a visit to the supermarket, which is some walk away, and also stopping into my local butchers and fishmongers to stock up on food for the week. Breakfast consisted of porridge made from pinhead oats (steel cut) cooked with water and with honey and clotted cream on top. This was accompanied by a black coffee. Lunch at work of two bowels of oxtail, barley, and vegetable stew along with a punnet of cherries and a black coffee. Dinner: Beer and more of the same stew. Dessert: Clotted cream and cherries with some honey on top. Breakfast: Pinhead oatmeal porridge cooked in the pressure cooker topped with cherries and pecans with some honey on top. Lunch: Caprese salad with some fresh tomatoes and mozzarella bought that morning on my weekly shopping trip to the big supermarket. Evening snack: A mince and mealie pie (ground beef and oatmeal pie) bought from my local butchers in the morning. Dinner: Fresh herring coated in oatmeal and marsh samphire from my local fishmonger with beetroot, onions, mushrooms, dulse, potatoes, and kale. Brunch: Grilled kipper (cold smoked whole herring), marsh samphire, a fried duck egg, and left-over onion, mushroom, and dulse from the night before. This was followed by a some Scottish raspberries. Afternoon snack: Half a packet of pecans and a punnet of cherries. Dinner: Beef liver and poached duck eggs from my local butcher, with onion, mushroom, and leek with some mashed potato and butter. Dessert was a white grapefruit. So there we have a week of my food shaped by both my tastes, available time and seasonal food (a lot of cherries), and my personal choices regarding health and nutrition. So said Jean Anthelme Brillat-Savarin, famed epicure and gastronome. What he would think of me from my food I do not know, perhaps lacking in the multiple courses and elegant French desserts of Brillat-Savarin’s own table. Being rather inept at remembering to keep a written diary I decided, out of interest, to keep a photographic record of everything I eat for one week. Whether this is of interest to anyone else I do not know. My diet is not set in stone, nor constant, and tends to evolve over time. Nor is it something I recommend for everyone or expect everyone to like as I eat the way I do for my own reasons. While it is difficult for the the observer not to alter what they are observing I shall attempt to eat as I usually do. So without further ado, on to breakfast. This weeks food was to a large extent based on food cooked at the weekend, supplemented with some a few freshly cooked additions. As I am currently finishing up my PhD my time during the week is limited making cooking ahead more important. Particularly at busy and stressful times I find that eating nutritious and delicious food is important to maintain my health. A late breakfast at work as I didn’t feel very hungry in the morning. Black coffee made in the cafetiere. The oxtail stew was made and the weekend and stockpiled in the fridge for the week. This consisted of a oxtail broth together with the meat of the bones, pot barley, parsnips, carrots, onion, kale, frozen peas, and dulse. While not always the most photogenic food, it is very satisfying, nutritious, and filling. The cherries are British grown and as they are currently in season, and delicious, I am making the most of them. More of the same oxtail, pot barley, and vegetable stew. Dinner consisted of a manx kipper (a whole smoked herring), a soft boiled local duck egg, with a mix of cooked kale, fresh broad beans, onion, and a tin of smoked oysters. The duck egg and vegetables had been cooked at the weekend and were reheated from the fridge. Plus a Hobgoblin Gold beer to finish. Duck eggs and whole grain rice, with kale, smoked mussels, fresh broad beans, and onion plus butter. All the food was cooked on sunday and reheated this morning. Plus a black coffee. As I had leftover food to use up this morning my breakfast was larger than it often is and I was feeling in need of something substantial. Even for breakfast plating food attractively is quite important to me even on a normal morning, I like my food to look nice. More oxtail, barley, and vegetable stew made at the weekend, cherries, and black coffee. I made the effort to actually go outside for lunch today as the weather was good for once, braving the seagulls that commonly patrol such areas of Aberdeen. Again premake food in the form of weekend stew makes for a substantial ready made lunch to take to work. Late afternoon snack: 5 pm. More oxtail stew. Cold dinners are comparatively rare for me, as I live in a cold, damp northern climate hot dinners are rather more satisfying. But as it is summer and the weather is still closer to what would generally be called “warm” I am making the effort to with some good buffalo mozzarella and British grown tomatoes. Currently on my third can of a four-pack of Wychwood Hobgoblin Gold. The season for British cherries is to short not to be taken full advantage of. They also combine well with some Cornish clotted cream and heather honey. Steelcut oatmeal cooked in my pressure cooker with cherries, pecans, and honey. An early dinner, as no lunch today, of oxtail, barley and vegetable stew and some beef cheek, butter bean and vegetable stew. Strawberry cheesecake Häagen-Dazs and another beer. Beef cheek, butter bean, and vegetable stew. Oxtail, barley and vegetable stew and some beef cheek, butter bean and vegetable stew. Together with a scotch whisky. Bone broth, also known as stock, is recently back in fashion with many purported health benefits. I will admit my own bias in being rather a fan of some good bone broth and suspect it is a beneficial component of the diet, although good research is currently still rather lacking. However, it is important not to idolise particular foods, as almost all foods have some potential downsides. Therefore, I was interested to find a potential downside to bone broth in the link between broth, gelatine, oxalate, and kidney stones. This may seem unlikely as bone broth does not contain any oxalate, but bear with me as this first requires a diversion into the formation of kidney stones and where oxalate comes from. Kidney stones are really quite common, affecting about 1 in 10 people at some point in their lives. Most (~90%) kidney stones are formed of crystals of calcium and oxalate. Crystals of calcium oxalate begin to form when the concentration of calcium and oxalate reaches a high enough concentration. This means that a higher concentration of oxalate in the kidneys is a risk factor for developing kidney stones. As oxalic acid is found in a variety of foods, patients with recurrent kidney stones are often advised to limit their intake of foods containing a lot of oxalate. However, the oxalate from food only makes up a proportion of the oxalic acid in excreted from by the kidney, with estimates of between 24% and 53% originating from the diet (Holmes 2001). The rest of the oxalate passing through the kidneys is produced by the body itself. Oxalate is the final step in the breakdown of a common amino acid called hydroxyproline. Collagen is the major structural protein in the body and also the most abundant protein making up from 25% to 35% of all the protein in the body. Mostly found in fibrous tissues such as tendons, ligaments, and skin. It is also abundant in corneas, cartilage, bones, blood vessels, the gut, spinal discs, and the dentin in the teeth. Normally, the collagen in our connective tissues turns over at a very slow and controlled rate and is always slowly being broken down and rebuilt. This constant renewal of collagen requires the body to remove excess amino acids released during the process. The metabolic pathways of hydroxyproline metabolism into oxalate. Source: (Knight 2006). The daily turnover of collagen from your own body is a major source of hydroxyproline. Just turning over your own collagen accounts for 5-20% of the urinary oxalate daily (Knight 2006). Excess hydroxyproline goes through a complex metabolic pathway in the liver. The majority of the hydroxyproline in this pathway is actually converted into another amino acid, glycine, and used for other purposes. There remainder is finally converted to oxalic acid and glycolate, which are excreted by the kidneys. We now return to bone broth of which hydrolysed collagen, better known as gelatine, is the main protein. It is gelatine that makes a good broth gel when cooled and contains the particular composition of amino acids that are currently making broth a popular health food. You can see from the pie chart below that hydroxyproline (Hyp) makes up 12% of the amino acids in gelatine. After eating broth or gelatine the body suddenly has a lot of hydroxyproline to deal with and a proportion of this is converted into oxalate. Change in blood hydroxyproline (Hyp) (inset), glycolate (■), and oxalate (–▲–) after ingestion of 10 g of gelatine. Source: (Knight 2006). When gelatine is consumed there is a rise in the amount of hydroxyproline in the blood for several hours. In a fascinating paper from 2007, John Knight and his colleagues fed ten subjects thirty grams of supplemental gelatine and then measured their blood and urine. From their graph below you can see that the hydroxyproline (Hyp) levels rapidly rose in the blood and remained up to four times higher for several hours. However, oxalate levels in the blood are more tightly controlled and did not rise. Amount of glycolate (■) and oxalate (–▲–) in the urine following ingestion of 10 grams of gelatine. Source: (Knight 2006). In comparison, the amount of oxalate in the urine increased for at least eight hours after consuming the gelatine. Oxalate concentration in the urine reached nearly five times higher a few hours after ingesting gelatine. This is due to the kidneys clearing oxalate out of the body as fast as it is being produced. This ten gram dose of gelatine would contain about a gram of hydroxyproline. Increases in urinary oxalate (■) and glycolate (□) excretion over fasting levels in a 6 hour period following ingestion of various amounts of gelatine. Source: (Knight 2006). This is all very well you may say, but ten grams of gelatine is rather more than most people consume in one go. Well, the authors quite rightly followed this up with a range of doses of gelatine more commonly found in the diet. You can see from the graph below that one and two gram doses had little impact on the amount of hydroxyproline. Between five and ten grams of gelatine, there was a significant increase in both hydroxyproline in the blood and oxalate in the urine. Interestingly, 12 grams is the serving of gelatine recommended by a popular geleatine supplement company, just to give perspective on the amounts involved. It would be appropriate now to ask how relevant this information is. There is certainly no study on people who consume bone broth or gelatine regularly and their risk of kidney stones. There is some epidemiological evidence that suggests it may be relevant. This comes from studies comparing meat intake and vegetarians. A recent study has found an association between meat intake and kidney stones, with a significantly reduced risk of stones occurring in vegetarians or people eating less meat (Turney 2014). The hydroxyproline content of meat products is suspected to play a role in this increased risk. Meat is the main source of gelatine in most peoples’ diets and a hundred grams of beef can contain a few grams of collagen. Of course, this cannot be treated as conclusive evidence as it is only an association. In an older study, meat intake – which contains collagen and hydroxyproline – was linked to increasing oxalate excretion, but only in a subgroup of men with unexplained recurrent kidney stones (Nguyen 2001). The research presented here is not a intended to scare people away from bone broth, stock, gelatine, or meat. Most people never get kidney stones and even for those who do, there are a number of factors that influence stone development. However, it is a potential factor that may be important for some people to know. As is it not commonly discussed, some people may not make a connection between broth or gelatine intake and kidney stones. If you need to reduce your oxalate levels, caution may be needed when taking extra gelatine or bone broth. Holmes RP, Goodman HO, Assimos DG. (2001) Contribution of dietary oxalate to urinary oxalate excretion. Kidney International. 59(1):270-6. “BACKGROUND: The amount of oxalate excreted in urine has a significant impact on calcium oxalate supersaturation and stone formation. Dietary oxalate is believed to make only a minor (10 to 20%) contribution to the amount of oxalate excreted in urine, but the validity of the experimental observations that support this conclusion can be questioned. An understanding of the actual contribution of dietary oxalate to urinary oxalate excretion is important, as it is potentially modifiable. METHODS: We varied the amount of dietary oxalate consumed by a group of adult individuals using formula diets and controlled, solid-food diets with a known oxalate content, determined by a recently developed analytical procedure. Controlled solid-food diets were consumed containing 10, 50, and 250 mg of oxalate/2500 kcal, as well as formula diets containing 0 and 180 mg oxalate/2500 kcal. Changes in the content of oxalate and other ions were assessed in 24-hour urine collections. RESULTS: Urinary oxalate excretion increased as dietary oxalate intake increased. With oxalate-containing diets, the mean contribution of dietary oxalate to urinary oxalate excretion ranged from 24.4 +/- 15.5% on the 10 mg/2500 kcal/day diet to 41.5 +/- 9.1% on the 250 mg/2500 kcal/day diet, much higher than previously estimated. When the calcium content of a diet containing 250 mg of oxalate was reduced from 1002 mg to 391 mg, urinary oxalate excretion increased by a mean of 28.2 +/- 4.8%, and the mean dietary contribution increased to 52.6 +/- 8.6%. Knight J, Jiang J, Assimos DG, and Holmes RP. (2006) Hydroxyproline ingestion and urinary oxalate and glycolate excretion Kidney International. 70(11): 1929–1934. Turney BW, Appleby PN, Reynard JM, Noble JG, Key TJ, Allen NE. (2014) Diet and risk of kidney stones in the Oxford cohort of the European Prospective Investigation into Cancer and Nutrition (EPIC).European Journal of Epidemiology. 29(5):363-9. Nguyen QV, Kälin A, Drouve U, Casez JP, Jaeger P. (2001) Sensitivity to meat protein intake and hyperoxaluria in idiopathic calcium stone formers. Kidney International. 59(6):2273-81. “BACKGROUND: High protein intake is an accepted risk factor for renal stone disease. Whether meat protein intake affects oxaluria, however, remains controversial in healthy subjects and in stone formers. This study was designed (1) to test the oxaluric response to a meat protein load in male recurrent idiopathic calcium stone formers (ICSFs) with and without mild metabolic hyperoxaluria (MMH and non-MMH, respectively), as well as in healthy controls, and (2) to seek for possible disturbed vitamin B(6) metabolism in MMH, in analogy with primary hyperoxaluria. METHODS: Twelve MMH, 8 non-MMH, and 13 healthy males were studied after five days on a high meat protein diet (HPD; 700 gmeat/fish daily) following a run-in phase of five days on a moderate protein diet (MPD; 160 g meat/fish daily). In both diets, oxalate-rich nutrients were avoided, as well as sweeteners and vitamin C-containing medicines. Twenty-four-hour urinary excretion of oxalate was measured on the last day of each period, along with 4-pyridoxic acid (U(4PA)) and markers of protein intake, that is, urea, phosphate, uric acid, and sulfate. Serum pyridoxal 5′ phosphate (S(P5P)) was measured after protein loading. RESULTS: Switching from MPD (0.97 +/- 0.18 g protein/kg/day) to HPD (2.26 +/- 0.38 g protein/kg/day) led to the expected rise in the urinary excretion rates of all markers of protein intake in all subjects. Concurrently, the mean urinary excretion of oxalate increased in ICSFs taken as a whole (+73 +/- 134 micromol/24 h, P = 0.024) as well as in the MMH subgroup (+100 +/- 144 micromol/24 h, P = 0.034) but not in controls (-17 +/- 63 micromol/24 h). In seven ICSFs (4 MMH and 3 non-MMH) but in none of the healthy controls (P = 0.016, chi square), an increment in oxaluria was observed and considered as significant based on the intra-assay coefficient of variation at our laboratory (8.5%). There was no difference in S(P5P)nd U(4PA)etween the groups after protein loading.